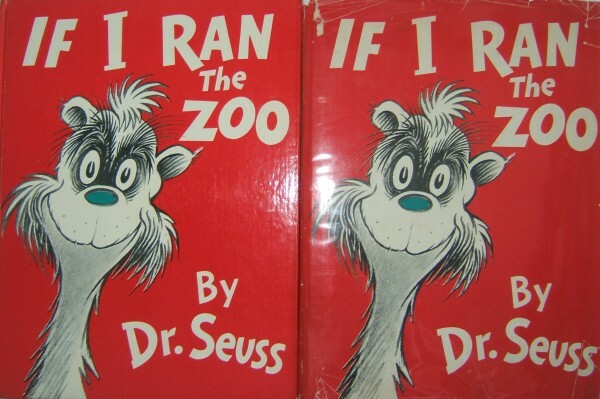 If I Ran The Zoo was the fourth post-war children’s book written and illustrated by Theodor Seuss Geisel, and eighth overall. “Although listed in Who’s Who as a man who juggles many careers, ranging from advertising and Movie Making to University Lecturing, Dr. Seuss is now spending more and more time at his favorite occupation – turning out wonderful nonsense for children. PUBLISHED IN NEW YORK BY RANDOM HOUSE, INC.
BASED ON MATERIAL WHICH ORIGINALLY APPEARED IN REDBOOK MAGAZINE. We own a 2nd printing book with “200/200” price on the dust jacket, and it has the eight line copyright information, with the Redbook Magazine reference. 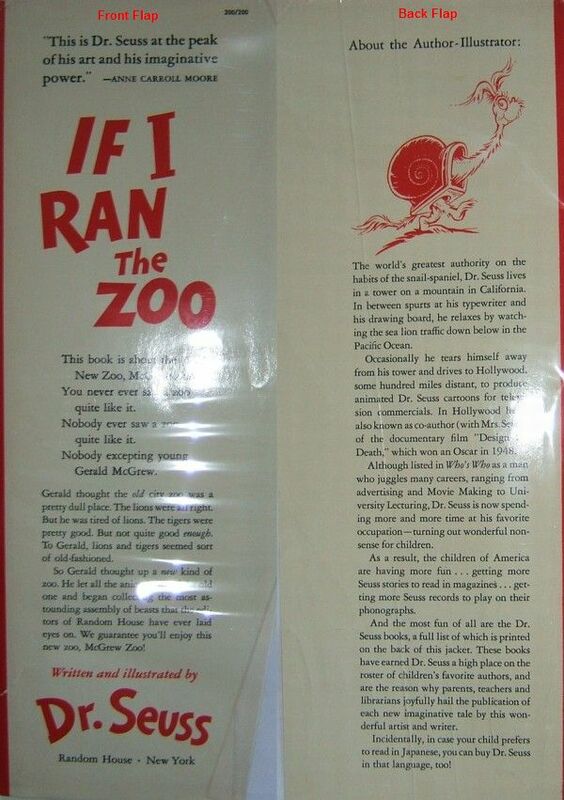 We also own a circa 1954 edition of If I Ran The Zoo, with “250/250” price on the dust jacket, and it has the eight line copyright information. 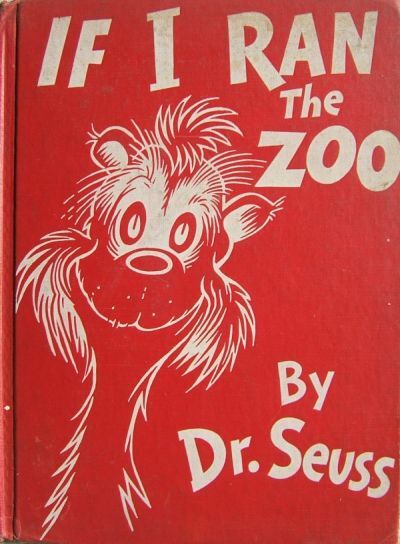 In addition, we also own a circa 1957 edition of If I Ran The Zoo, with “295/295” price on the dust jacket, and it also has the eight line copyright information. 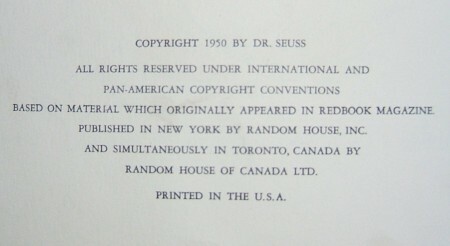 This reinforces the seven line copyright , absent the line with the Redbook Magazine reference, as the true first printing of the book. 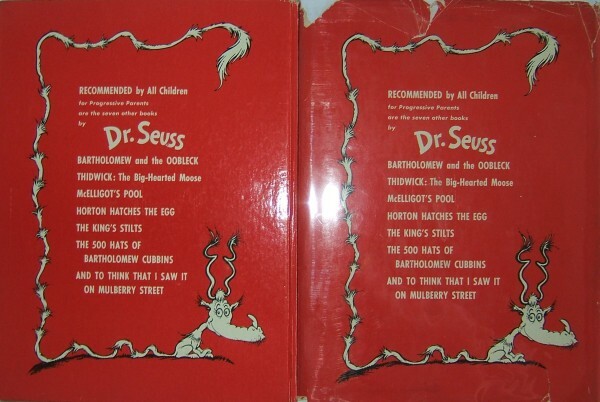 Book back is the same as back DJ, seven previous Dr. Seuss titles listed chronologically, with Bartholomew and the Oobleck at the top, list ending with And To Think That I Saw It On Mulberry Street. 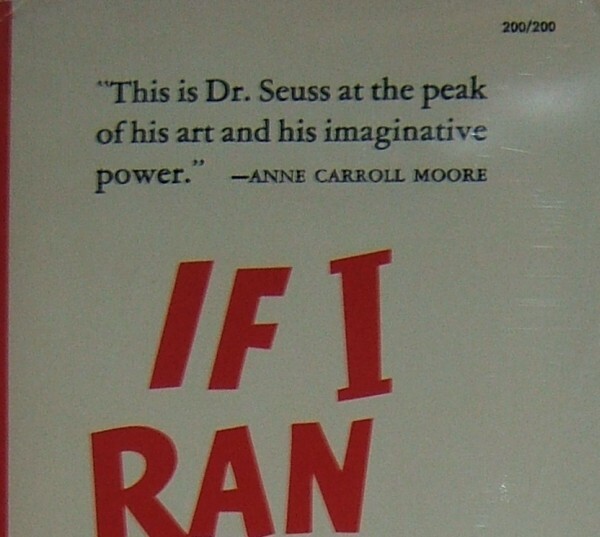 Dust jacket: First printing price on top right front flap of “200/200”. Back DJ lists seven other books chronologically by Dr. Seuss, with Bartholomew and the Oobleck at the top, list ending with And To Think That I Saw It On Mulberry Street. 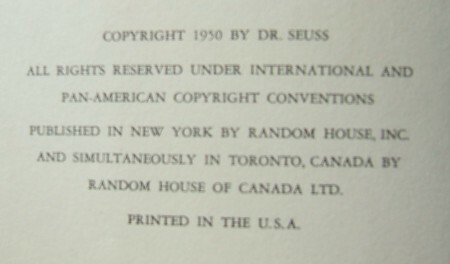 The Junior Literary Guild Edition also has the correct seven line copyright page, with the omission of the Redbook reference.